Group hollers, harmonica, fiddle, banjo, acoustic bass, snare and bass drum make these original compositions a unique instrumentation that joins acoustic blues and traditional jazz. 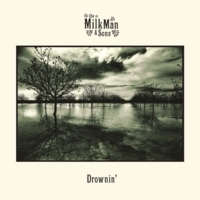 This is the second album by theMilkMan joined this time by sons Rob Hecht on violin, Jake Sanders on banjo, Rob Adkins on bass and Alex Ritz on drums. This album boasts a bigger sound yet keeping with its acoustic blues roots and venturing into some traditional jazz. theMilkMan is the alter-ego of professional jazz chromatic harmonica player Marcus Milius. He developed his sound busking the streets of Los Angeles, Tokyo, London, Barcelona and New York. When Marcus is not in a recording session or playing with any variety of bands you can catch theMilkMan at a small venue or in the subway tunnels. This music looks back to the origins of American music and for Marcus it is his homage to those artist who first influenced him. theMilkMan is his affair with the power of the word, and his flirtation with the honesty and imperfection of blues music. Drownin' was recorded in one short 4 hour session. The group had grown comfortable together playing traditional jazz six nights a week at Shanghai's famous House of Blues and Jazz. On an early afternoon at the club mics went up and the fellas recorded live a bunch of songs they had never played before. What you hear is a first impression on the music you by a seasoned group of musicians having fun.